I am a frequent a frequent online shopper and have encountered my fair share of horrendous level of services with courier companies. They don’t come at the agreed time range. For example, delivery timing of between 2pm – 6pm was arranged but they arrive at 12pm or 7pm. When you call for re-delivery and ask to send to address B instead of address A, they agree but still sends to address A resulting in yet another failed delivery. When you call for re-delivery, everything appears to be fine but no one turn up. You call to complain and they arrange for re-re-delivery. You leave the premises and the driver turns up when you have already left. Recently, I ordered something for my girlfriend and arranged for courier service. 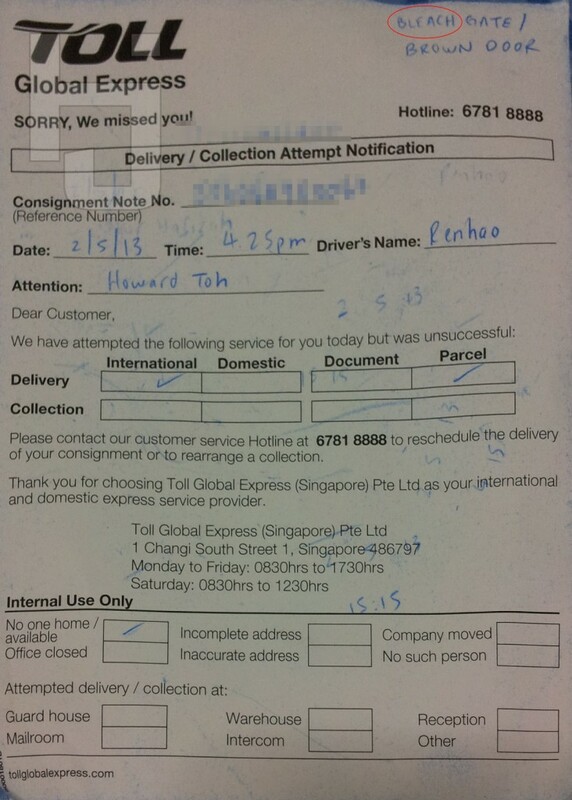 The item was shipped on 29th April 2013, arrived in Singapore on 30th April 2013. Everything looked perfect! 1st May was Labour Day so fair enough, they ain’t working. On 2nd May, the courier guy named “Renhao” dropped a delivery advice at my door as he came at 4:25pm when no one was around. I was impressed that he wrote down the colour of my gate and door as proof of attendance (though I’m not sure how my gate is the colour of bleach). 3rd May first thing in the morning, I called up Toll Global Express, the courier company, to arrange for re-delivery. I asked for delivery to my office near Ubi and the staff agreed. I gratefully thanked him and gave him both my mobile numbers just in case the courier guy couldn’t reach me at one of my numbers. Delivery was arranged for 2pm to 6pm on the same day. At 5:30pm, there was still no news so I called them again. A staff answered and assured me that according to his system records, the delivery will be done by 6pm. I asked him to call the driver to confirm as I am leaving the office at 6pm. He promised to call back. He said he will check with his supervisor and will call me back. He called me back shortly and said that even his supervisor could not trace my item. He then asked me if he could arrange for re-delivery the very next day. I asked him how was he going to arrange for re-delivery when none of them know where my item is? He could not give me an answer and just kept asking me whether I can make it for the following morning. I told him no as I am leaving the house very early in the morning and will be out the entire day. He also admitted that nobody made arrangement for re-delivery today and asked me who I spoke to. I asked him to check who had updated both my mobile numbers in the system (because he could read them back to me). He responded sheepishly that they have many new hires and they are sharing a single ID right now which made it impossible to trace who was responsible. Great, now they make THEIR internal problem MINE. I asked to speak to his supervisor and he said his supervisor is out and he will ask her to call me back later. I asked him to arrange for a Sunday morning delivery which he said that only his supervisor can approve. I agreed to let him get his supervisor, Giselle, to call me later to confirm the Sunday morning appointment. Giselle did not call at all. Well, let’s see if I get my item on Sunday. I don’t think that I am unreasonable. I paid premium for courier delivery, I cannot accept the courier company saying that they don’t know where my item was, they don’t know who took my re-delivery request because they were using a common ID, etc. They should call themselves TROLL Global Express. My item appeared magically at my house when I specifically asked for them to deliver to my gf’s place as I wanted to give it to her over the weekend. No calls, no apologies, still as screwed up.